WASHINGTON — Forget kale, wheatgrass and cayenne pepper — the main ingredient going into today’s health drink of choice is bone. For centuries, bone broth has been a staple in many home kitchens: Mothers nourish their children with the homemade liquid; some cultures use it as a palate cleanser between courses, and others use it as a digestive aid. But now, the simple simmered stock is making a mainstream comeback. Last year, New York chef Marco Canora opened Brodo, a take-away window out of his East Village restaurant that serves to-go cups of bone broth to long lines of New York models, hipsters, health nuts and professional athletes. (Yes, broth is even a staple of the Los Angeles Lakers’ diet). More recently, celebrity chef and Bravo TV personality Tom Colicchio named bone broth one of the hottest food trends of 2015. The health benefits explain broth’s popularity. The New York Times reports that the collagen, amino acids and minerals released from the bones as the broth cooks down can provide relief for inflammatory diseases and digestive problems. Additionally, Washington Post contributor Casey Seidenberg says the calcium, magnesium and phosphorus in bone broth helps bones grow and repair, and the collagen and gelatin help to strengthen, hair, nails and skin. Washingtonians anxious to get their hands on a cup of broth no longer have to trek up to New York. Halsa, a new health-focused restaurant in D.C.’s Brookland neighborhood, serves the beverage, and on Monday, Red Apron’s Penn Quarter location added broth to its offerings. For Nate Anda, founder and butcher at Red Apron, adding broth to the menu was one of the easiest additions he’s ever made. That’s because he’s been using bones in his whole-animal butchery to make and sell stock from the beginning. “We have the space; we have the bones, so we’ve always made these stocks that are high in gelatin and flavor,” he says. But it wasn’t until a friend told Anda how much bone broth helped bring relief to her auto-immune disorders that he decided to sell heated broth for sipping, in addition to the cartons of cooking stock available in the store’s refrigerated section. “We didn’t have to change anything. I add salt to them to be served, but this is the stuff we’ve been selling for the last two years,” he says. 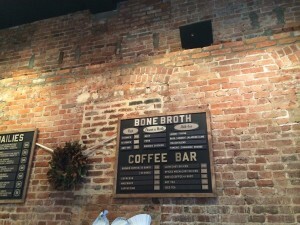 The broth served at Red Apron, Brodo and Halsa is different from the conventional stocks that line store shelves. Commercially prepared broths are often high in additives and sodium, and bouillon cubes and other stock flavorings often contain MSG, The Washington Post reports. Anda offers three varieties of broth at Red Apron — beef and pork, each of which he cooks down for 36 hours, and chicken, which he cooks for 24 hours. Customers interested in trying a cup of broth can order the beverage in 8-ounce and 12-ounce pours (which cost $4.25 and $5.50, respectively), and for an additional 50 cents can opt for a sachet of fresh spice blends (lemon and thyme; turmeric, orange and cinnamon; basil, ginger, jalapeno and lime; and fennel, oregano, lemon, garlic and chili flakes) to add an additional flavor element. 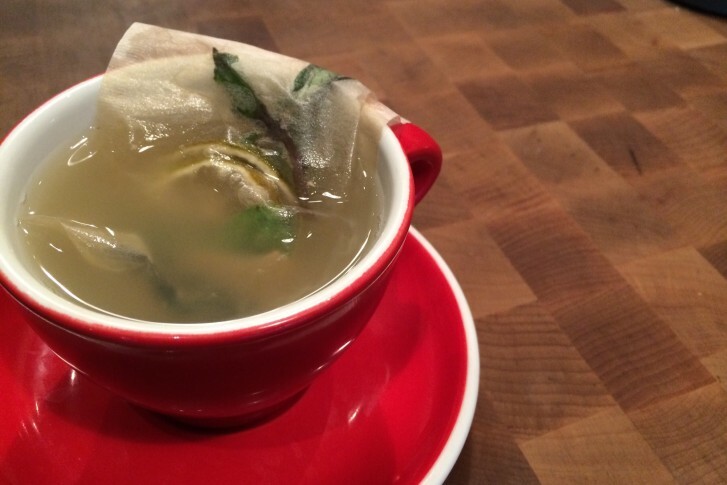 “If someone doesn’t like the idea of just drinking broth, they have something to bring into play,” says Anda, who adds that the sachet of basil, ginger, jalapeno and lime is a play on pho, where the lemon and thyme is a more traditional soup flavor. “And the Italian one has all of the things that go into my meatballs,” Anda says. So far, Anda has seen more demand for broth from the local paleo community and less from those chasing the trend. Anda has even started to drink broth routinely himself, often as a substitute for a late-afternoon coffee. And while a flavorful cup of steamy broth is the perfect comforting treat on a cold, snowy January afternoon, Anda wonders whether people will be as eager to sip broth during the region’s warmer months. “I don’t mind the idea of it being a trend, but I’m interested to see what it’s like in June or July, whether or not someone wants to drink it,” Anda says.